1) Chef Will Gilson and the Puritan and Co. team invite guests to enjoy a cone (or six) at their upcoming soft serve pop-up. The team at Puritan & Company is embracing the warm weather with the addition of a one-time-only soft serve pop-up on Saturday, July 9th. From 11 a.m. to 4 p.m. the space next to Puritan & Co. will transform into a decedent soft serve pop-up concept. The soft serve will cost $5 with homemade toppings available for an additional $0.50 each. Specialty Puritan and Co. sandwiches may also be available for purchase. 2) This Independence Day, Bukowski Tavern in Cambridge’s Inman Square will host a luau-themed celebration in honor of our nation’s fiftieth state. Courtesy of Buks, the Hawaiian 4th of July fête will dress patriots in grass skirts, leis and coconut bras to get into the festive spirit. Chef/owner Brian Poe will be serving up the special Hawaiian Luau Burger with spicy Napa cabbage, cucumber, mango and peanut slaw, spam bits and guava BBQ sauce ($12.95). To sip, bar manager Justin Lipata will lead the team in pouring tiki drinks while tapping the kegs to specialty brews including Goose Island’s Four Star Pils, 10 Barrel Brewing Co.’s Piña, a seasonal wheat beer with pineapple and passion fruit, and a special cask of the grapefruit peel-infused Blue Point Hoptical Illusion. 3) Parsnip Restaurant and Lounge invites guests to enjoy the warm, summer weather on their newly opened patio. Parsnip’s new patio, located adjacent to the restaurant’s Winchester Street entrance is the perfect spot for enjoying a bite while people-watching in Harvard Square’s Winthrop Park. The space, shaded by sleek umbrellas, seats 20 and is open Tuesday through Saturday from 4:30 p.m. to 11 p.m.
4) Owner Nick Frattaroli, Chef Kenny Schweizer, and General manager Mike Wyatt of Ward 8 have unveiled a new summer menu showcasing the season’s bounty. 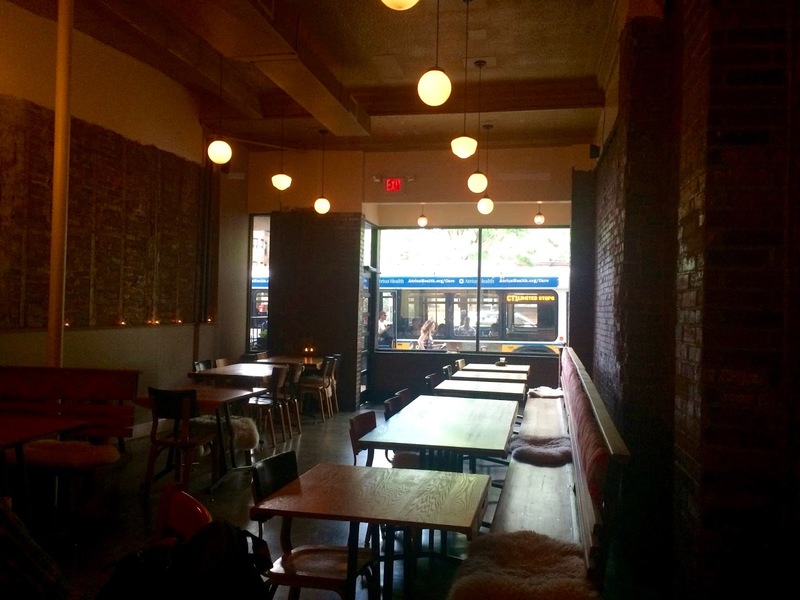 The cuisine and cocktails on the menu reflect Ward 8’s commitment to providing guests a casual but refined dining experience in Boston’s North End. New, summer menu highlights include: Lobster “Hole” with fresh shucked lobster, black truffle mayo, griddled brioche and sweet potato fries; Crispy Pork & Watermelon with braised pork belly, fresh watermelon, watercress and feta; Curried Mussels with beer-steamed mussels, curry coconut broth and country bread; Carpetbagger Carpaccio with beef carpaccio, fried oysters and pickled crème fraiîche; Pan Seared Shrimp & Scallops with sweet potato gnocchi, tomato, scallion, spinach and citrus fumet; Fried Clam Lettuce Cups with whole belly clams, slaw and pickle chips; and raw bar options including a Seafood Plateau, Lobster Cocktail, Chilled Steamed Clams, and more. Ward 8 is also now hosting Oyster Mondays and Lobster Clambake Sundays. Every Monday night throughout the summer from 5 p.m. to 12:30 a.m., Ward 8 is serving up grilled oysters for $1.50 and raw oysters for $1. Every Sunday night throughout the summer from 5 p.m. to 10 p.m., Ward 8 offers a delicious Lobster Clambake for only $35, which includes a full lobster, clams, corn on the cob, mussels and chorizo sausage. To complete the dining experience, Ward 8’s carefully curated menu of high-quality, craft cocktails has been updated to highlight the summer’s flavors and ingredients. Ward 8’s delicious and refreshing cocktail options now include: Charles Marie with passion fruit, green chartreuse, cacao and club soda; After School Special ketel oranje, falernum, pineapple and mango pale ale; Hotline Sling tanqueray 10, aperol, lemon and pink bubbles; and Cute But Pyscho ron zacapa, grapefruit, lemon and bantam cider. 5) Experience an All-American feast at Davio’s Northern Italian Steakhouse in honor of the Fourth of July as Davio’s is offering two exclusive specials just for America’s birthday. Available on Saturday, July 2 and Sunday, July 3, the Surf N’ Turf Burger ($30) takes it to the next level with the bi-coastal bounties of Kobe Brandt beef from California and fresh Maine lobster, topped with truffle béarnaise sauce and served with a heaping side of truffle fries. And available from Tuesday, July 5, to Friday, July 8, enjoy some Red, White & Blue Sangria ($13), a light and fruity libation. 6) Local beverage innovators Spindrift and Night Shift Brewing share values of making real, quality ingredients a priority in everything they do, and for one night are aligning for a fun summer celebration of Boston’s real food movement, and the consumers who care as much about what they drink as what they eat. The evening will highlight Boston’s freshest food and drinks with local food trucks brought in for the occasion, live music, complimentary Spindrift and an interactive “The Real Squeeze” station where attendees can fresh-squeeze their own Spindrift flavors. Spindrift is proud to make the first and only sparkling waters with real, fresh fruit. The water is triple-filtered, and the fruit is picked from family farms and then squeezed and bottled/canned within only a few days from harvest. The result is light, bright, and slightly pulpy sparkling beverages. Night Shift Brewing was founded in 2012 by three friends passionate about home brewing. This Massachusetts brewery aims to create and share a world-class culture with memorable craft beers that offer a wide array of unique, complex flavors through culinary inspiration and innovation. Diners can choose from a refreshing variety of slushie flavors including Pineapple Coconut Punch, Yamato Mule, and a rotating “Slushie du jour.” Night Market’s Lick ‘em Sticks includes five sticky rice balls served with garnishes and an addictively tasty dipping sauce. Guests must be 21+ and show valid identification to take advantage of the special. WHEN: Available Tuesday through Sunday from 5 p.m. to close whenever the temperature is 85+ degrees. I have tasted the Sake Slushies and they do a very good job, and the slashes definitely are perfect for summer weather. 8) Chef Moe Kuroki of OISA Ramen is hosting another pop-up event, this time at Brassica Kitchen + Cafe, located in Jamaica Plain. The event will be held on Monday, July 11, from 6pm-9pm. The Ramen Dinner ($35/person) will include three courses and you must purchase tickets ahead of time as there is a limited amount of ramen available. And Chef can work with dietary restrictions if she is notified 5 days before the event. Please let the Chef know if you have food allergies, because not all of the ingredients are listed. There will also be an a la carte Izakata menu offered all night, with no ticket purchase nesessary. I've been to a couple of the OISA Ramen events and the Ramen is absolutely delicious. This should be an excellent event and I highly recommend you check it out. Now that we understand how popular it is, we should learn more about the basics of Baijiu, from how it is made to its various styles and types. Please note that I'm providing some broad generalizations here and that there are plenty of exceptions and differences in such a large spirits industry, comprising about 10,000 distilleries. At its most basic, Baijiu is a grain-based, Chinese distilled spirit. It is also a white spirit, in color, that is produced similar to a brown spirit. In some respects, it's production methods also remind me of elements of Sake brewing. Baijiu can be produced from a number of different grains though sorghum is the most common. Sorghum is a very hardy plant, able to withstand many drought conditions, and with a number of defenses against insects and other animals. It can grow in places where most other grains cannot and is a common grain in parts of Africa too. Regions with high amounts of sorghum often made beer from that grain, and sorghum beer is still made in many parts of the world. In China, sorghum also became the dominant grain for distillation. In the U.S., though other grains, from rye to corn, dominated the spirits industry, sorghum was still used by some to make beer, wine and spirits. For example, in 1950, about 789,000 tons of sorghum were used to make spirits though that significantly decreased to 88,000 tons by the 1970s. And during that 20+ year period, more sorghum was used to create spirits than rye. Currently, the U.S. is the world's largest producer of sorghum and it is fascinating that about 95% of that crop is exported to China! Other grains that are commonly used for Baijiu, sometimes in blends, include rice, glutinous rice, corn and wheat. Some distilleries have their own secret blend recipes while others freely reveal the proportions in their blends. After the grain or blend has been selected, it is then cooked. There is an intriguing preparatory step prior to the fermentation phase, the creation of the qu, (pronounced "chew"), a starter culture that is very similar in some ways to the koji used to produce Japanese Sake. To make qu, which was invented around 2000 years ago, they leave a packed brick or ball of damp grains out in a warm place for a month or longer, allowing all sorts of yeasts, fungi and other microorganisms to grow on it. The role of qu is to saccharify the starches in the grain so that yeast can turn the sugars into alcohol. Once ready, the qu is crushed and the powder is mixed in with the grain blend for fermentation. Most spirits undergo a two step process, where the grains are first saccharified and then fermentation occurs. With Baijiu though, the process entails multiple parallel fermentation, where the saccharification of the starches and the fermentation of the sugars occurs simultaneously. That is similar to the production of Sake, one of the only other alcohols made through multiple parallel fermentation. Within the Sake fermentation vat, there is koji which helps to break the starches down into sugar at the same times as the yeast turns the sugars into alcohol. In addition, Baijiu is produced through solid-state fermentation, meaning that it occurs without adding water to the grain and qu mix. The fermentation of nearly every other spirit requires the addition of water, making Baijiu more unique. Again though, Sake is one of the few other alcohols which conducts solid-state fermentation, with the creation of koji, though later in the process, additional fermentation does occur with the addition of water. Fermentation of Baijiu commonly occurs in 10 foot deep mud pits! The grain and qu is placed into the mud pit and another layer of mud is placed atop it. They regularly wet the mud with water or Baijiu, and it takes about 70-80 days to ferment. In southern China, the climate leads to a longer fermentation period than it does in northern China, a difference of about 15-30 days. Distilleries are very attached to their locations and mud pits, some which can be over 100 years old, and they believe the mud pits create a specific taste typical of that location because of the microorganisms in the mud. It is thus considered a fact that these mud pits contribute to the flavor of the Baijiu. I'm unaware of any other spirit that is fermented in a mud pit. Once fermentation is complete, you might have remaining either a large pile of grains or a mash which has some liquid which needs to be separated from the liquid. The liquid is referred to as huangjiu, "yellow wine." The mash is not wasted and is commonly returned to the mud pit, kind of like a solera method. Some old mud pits thus end up with some mash that could be over 100 years old or more. This recycled mash may also make some slight changes to the grain proportions of the blend so what you see on the label might not be fully accurate. The fermented solids or liquid is then distilled and steam is often used to heat it. The number of distillations will vary from producer to producer and it is alleged that Kweichow Moutai is distilled forty times, though that doesn't seem credible. The distilled spirit is then aged in terra cotta urns, commonly for a year or two, though you will find some Baijiu that has been aging for 80+ years. These porous vessels are considered a way to purify the product, and don't add any flavor or color to the spirit like oak would do. It is said that with this type of aging, you lose more than you gain. Once the aging is complete, the spirit is diluted a bit with water to bring the proof down to roughly 100-120. The Baijiu also usually undergoes a blending process, using different aged spirits, which helps to provide consistency to the final product. Due to the complexities and diversity of Baijiu, the Chinese government worked at classifying Baijiu, to make it a bit easier to categorize. As such, Baijiu is now generally divided into four main categories, identified by their aroma, which is another thing that makes Baijiu unique. Do you know any other spirit that is categorized by smell? I don't. The four basic categories include mi xiang (rice aroma), qing xiang (light aroma), nong xiang (strong aroma), and jiang xiang (sauce aroma). Rice aroma is the mildest of the group, with a sweeter flavor and often floral notes. Americans who are starting out with Baijiu might want to begin with this category, the same that if you were getting into Scotch you would start with a mild type first, like Glenmorangie, rather than just jumping in with a highly peaty Scotch like Laphroaig. Light aroma is also relatively mild and smooth, and generally are the least expensive to make. Strong aroma, the most commonly consumed style, is commonly spicy, pungent and fruity with a strong taste on the finish. Some of these Baijiu can be very expensive. Sauce aroma is full-bodied, with a very strong and savory aroma that might remind you of soy sauce or blue cheese, a very earthy, gamey smell. Generally, these Baijiu undergo numerous distillations and lengthier aging. The strong aromas and flavors are akin in some respects to a peaty Scotch, a profile that isn't for everyone but which aficionados greatly enjoy. To me, the Sauce style reminds me more of Kimoto/Yamahai Sake, which also possesses gamey/earthy flavors and plenty of umami. Baijiu, a distilled spirit that originated in China, seems to me to be the Durian fruit of the spirits world. The infamous Durian fruit, native to Southeast Asia, has a reputation for possessing one of the most foul odors you will ever smell, sometimes described as similar to rotten onions, road kill, or even sweaty socks. However, there are plenty of people, especially in Southeast Asia, who love the taste, and even the smell, of Durian, often considering it to be the "king of fruits." Baijiu too has a reputation with many people of having a foul smell and taste, reminiscent of stinky cheese, gasoline, and even sweaty socks. However, it is also the most popular spirit in the world, due primarily to its massive consumption within China. It is an integral part of Chinese culture yet its popularity outside China has problems, mainly because a significant number of people believe it has a horrendous taste. Like Durian, Baijiu isn't properly appreciated outside of Asia. In addition, many Americans know very little, if anything, about Baijiu and if they do possess some limited information, it may be a mix of errors and misconceptions. Hopefully that will soon start to change. Baijiu can now be found in a growing number of restaurants and bars, and during the last year, a number of media outlets have written basic articles about Baijiu. It's certainly a niche beverage in the U.S. but it's fascinating and you'll find the taste often isn't quite what you expect. There is good reason why Baijiu deserves greater recognition in the U.S. I'm relatively new myself to the wonders of Baijiu but I'm very much intrigued by the spirit and have been trying to learn much more about it. I see some similarities to Japanese Sake and am curious about Baijiu's potential pairing with food, based on its apparent umami nature. The Baijiu I have tasted have been delicious, without any tastes or aromas which turned me off. It's a spirit I recommend that you explore as well and I want to provide you some information about Baijiu, from its history to production methods, to encourage your own exploration. During the next few weeks, I'll be posting a number of articles about various aspects of Baijiu, trying to show its complexities and mystery, its variations and delights. I hope that you find it to be a fascinating journey and I encourage your feedback. Recently, at Thirst Boston, I attended a compelling seminar, Baijiu: The Most Popular Drink You've Never Heard Of, which was described as: "Baijiu is likely the world’s oldest distilled spirit and currently the most consumed – and yet it’s virtually unknown in the United States. This is your opportunity to taste some of the most complex and unique spirits that have ever been made by distilleries dating back to the 15th century. Learn about how Baijiu differs from all other distilled spirits in the world and taste for yourself the regional and stylistic differences between different expressions." This was probably one of the first Baijiu class in the Boston area that was open to the public and it was an excellent opportunity to learn the basics of this spirit and get to taste five different Baijiu. It helped set the stage for my further explorations of Baijiu. There is also a single English book about this Chinese spirit, Baijiu: The Essential Guide To Chinese Spirits by Derek Sandhaus, which has been helpful in providing additional information about Baijiu (and which I will review in a later post). In addition, I've consulted numerous magazines, online articles, scientific journals, and books that mention this spirit. We certainly need more English articles and books about Baijiu as it seems we've only scratched the surface of its potential. The Thirst Boston Baijiu seminar was presented by Manny Burnichon, founder and CEO of Private Cask Imports as well as National Brand Ambassador for CNS Imports, which has been importing Baijiu into the U.S. for about 32 years. Who knew Baijiu has been available in the U.S. for that long? CNS used to sell Baijiu primarily in Asian communities in the U.S., especially in Los Angles, New York City and Texas. Now though, they have begun a push to market Baijiu to the non-Asian market in the U.S. and face a number of obstacles, including misinformation and ignorance about Baijiu. I hope that my posts about Baijiu might contribute in even a small way to help educate consumers about this interesting Chinese spirit. Baijiu is most often pronounced as "bye joe," but there are different sources claiming it is pronounced as "bye gio," "bah joo" or "bye zho." The term "baijiu" was derived from two words, "bai"(“transparent”) and "jiu" (“alcoholic drink”), so baijiu is roughly translated as "white liquor," reflective of its white color. In addition, baijiu is also sometimes known by other terms such as samshu (Cantonese for "thrice fired"), baigan and shaojiu. It is difficult to pinpoint the exact origin of Baijiu, with some sources claiming its ancestors extend back two to three thousand years. Many sources seem to agree that it was most likely invented about a 1000 years ago, though it didn't receive the name Baijiu until about 300 or so years ago. There are some Baijiu distilleries that can trace their history back 500-600 years. Baijiu is an important element of Chinese culture, something which is essentially consumed at every restaurant, at every holiday, for every special occasion and with every business deal. It is even entwined within Chinese diplomacy, as in 1951, Zhou Enlai, the first Premier of China, declared Kweichow Moutai Baijiu to be the National Liquor. As such, it is regularly served at official state dinners and U.S. Presidents from Richard Nixon on have been toasted with Moutai. The title of the Thirst Boston seminar, "The Most Popular Drink You've Never Heard Of," is a common refrain, almost a cliche now, in many of the recent articles in the media about Baijiu. Some outlets are just trying to be trendy, to highlight a new spirit before they move onto writing about the next hot, new spirit. Other are more serious about Baijiu, trying to introduce Americans to this intriguing Chinese spirit. Even if the phrase seems to be getting over used, it is hard to deny the truth of that matter. Many Americans know little, if anything about Baijiu, and it's the most popular spirit in the world. How can it be so popular yet Americans be so clueless about its existence? Statistics on Baijiu consumption and sales are not always easy to find, and one of the major reports on the matter came from International Wine & Spirit Research. In 2012, Baijiu was the largest spirit category in the world, based on consumption, at 31% (over 11 billion liters) while second place was occupied by Vodka, at 19%. The next three spots were taken by Whiskey (11%), Shochu (9%), and Brandy (6%). The value of the Baijiu market was approximately $23 billion, accounting for about 55% of the alcohol value in China, with beer accounting for 31% and wine only 7%. Of the $23 Billion in Baijiu, it is broken down into low end (21%), value (18%), standard (30%), premium (17%) and super premium (14%). There are said to be about 10,000 different Baijiu distilleries in China, producing an enormous diversity of Baijiu, from very cheap alcohol to super premium bottles which can cost ten of thousands of dollars. Back in 2010, the #1 spirit brand in the world was Johnny Walker and Kweichow Moutai, a Baijiu, was down at #9. However, only three years later, Johnny Walker was still #1 but Kweichow Moutai had moved up to #2. And presently, Kweichow Moutai has continued its climb and now sits at the #1 spot, having finally dethroned Johnny Walker. That is an epic climb in a short amount of years. Within China, the primary demographic currently consuming Baijiu is men over 40, while the younger generation tends to gravitate more toward other spirits and drinks, such as Western-style cocktails and wine. This is similar to what occurred in Japan as younger generations moved away from drinking traditional Sake. However, unlike Sake and despite these demographics, Baijiu still saw double-digit growth during the period of 2007-2012. Much of that growth was attributable to the government, which was responsible for 40%-50% of all Baijiu purchases. It would then be the government which would cause chaos within the Baijiu industry. In 2012, in order to combat corruption, President Xi Jinping enacted a series of anti-graft measures, partially to drastically limit the amount of expensive Baijiu consumed at official government dinners and business events. With the crackdown, Baijiu producers saw a significant decrease in purchases, leading to only a 3% growth in 2014, much different than their prior double digit growth. Obviously, with the industry's prior reliance on the huge government market, the new laws were destined to reduce sales. Thus, Baijiu producers started a more concerted effort to find new markets for Baijiu through exportation though this is still in its relative infancy. This is also what some Sake breweries have done to help their industry because of decreased Sake consumption within Japan. Sake producers have started increasing exports to places like the U.S. and Australia. Interestingly, Baijiu sales have started to rebound, having increased by about 7% in 2015. As for exports, Australia is currently the #1 market while the U.S. is at #2, with the bulk of sales to Chinese immigrants. Importers are hoping that those demographics will change, with a greater number of non-Asians embracing Baijiu. For this to occur, American consumers need to be given reasons why they should drink Baijiu. For the last few years, as a special addendum to that series, I also posted some lists of my Favorite Fiction books. Following that tradition, I'm here to post a list of my Favorite Fiction of the first six months of 2016. During this time period, I've read over 100 books, both fiction and nonfiction. This list will provide you an overview of the best books I've been reading this year. The following lists of favorites will include books of Science Fiction, Fantasy, Horror and Mystery/Thrillers. Though many of these books were published in 2016, there might be a few from previous years, but I first read them this year so they will be included here. Please also note that these books are not in any specific order of preference. I am very interested to see which of these books will still be in my Top Ten lists at the end of the year. I already know there are some potentially excellent books due out during the next six months so there will be serious challengers to those currently on these lists. All of these books would make great summer reading and a number of these authors have also written other worthy books. Please support an author, a small, independent business person, and buy more books. With an unassuming store front, you might just walk by Asta and never check it out. That would be a serious mistake. I feel bad that even though the restaurant has been open for a few years, I hadn't dined there until earlier this week. I had read the raves, heard plenty of people recommend the place, but I just hadn't been there and there was really no reason why. Fortunately, my good friend Adam Japko, who has dined at Asta numerous times, convinced me to join him for dinner there this week. And now I can't wait to return. Chef/Owner Alex Crabb (on the left side in the above photo), previously worked for about seven years at L'Espalier and also spent a couple months in 2011 working a stage at the famed Noma in Denmark. Alex's partner, Shish Parsigian, runs the front of the house, and I had the chance to meet both of them. They bring a certain energy to the restaurant and Shish was very personable. There is no pretension here, instead there's a casual and fun elegance. It is a place to relax and enjoy great food & wine. When I dined at Asta, I didn't take any notes, though I took numerous photos, as I wasn't planning to do a detailed review. Instead, I was more there just to spend time with a friend, enjoying a nice dinner with a few wines. However, the experience was so compelling, I needed to write something about it, to share my positive experience with my readers. The small dining room has lots of wood tables and chairs, with numerous furs on some of the seats. When's the last time you saw a fur covering your chair at a local restaurant? There are also two small counters near the kitchen, each seating about six people. We sat at one of the counters, allowing us a better view into the open kitchen area. Much of the kitchen is open, with a smaller, enclosed area in the back. You can watch all of the prep work, seeing the Chef and other cooks ensure each dish looks perfect. You'll probably also see dishes from the various menus pass by, making you yearn for something which isn't part of the menu you ordered. You'll have to return to try another menu. Asta only serves three different tasting menus, a three-course ($50), five-course ($75), or eight-course ($95). Each menu has different dishes, with the more adventurous items on the eight-course menu. You can also get a supplement of Seared Foie Gras for an extra $30. Wine Pairings are available for the five-course (+$45) and eight-course (+$60) meals. You can also order wine, by the glass or the bottle, or beer. The wine list is relatively small but well-curated, diverse and interesting. Wine geeks are really going to enjoy this list, and Shish can help you navigate through the choices. There are 6 wines by the glass ($10-$16), from Soave to Grignolino, Cinsault Rosé to Dolcetto. There are 20 wines available by the bottle, including 2 Sparkling, 8 Whites, 1 Rosé and 9 Reds, priced $60-$167. There are also 7 other wines available by the glass, including Sherry, Madeira and Dessert wines. You'll also find 8 beers on their menu, priced $6-$14, from countries including Japan, Belgium, Germany and more. When you are first seated at Asta, they deliver a small glass of bubbly to you, a fine way to begin your meal. We opted for the eight-course dinner, ordered a couple bottles of wine (a white and a red), and also opted for a couple of wine pairings with specific courses. 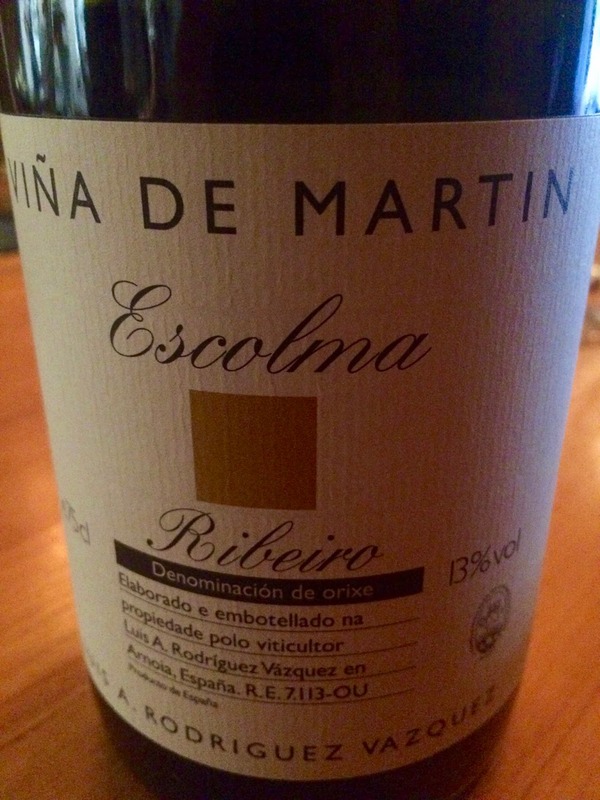 For a white wine, we selected the 2010 Luis Rodriguez Vina de Martin Escolma Blanco ($104) which is from the Ribeiro D.O. in the Galicia region. Luis Rodriguez has been producing wines in this region since 1988 and currently owns about 5 hectares of vineyards. He ferments his wines with native yeasts and all of his white wines are aged on the lees. The Escolma Blanco is a blend of 20-40 year old vines of Treixadura, Albariño, Torrontés, and Lado. This is a quality cuvée that is only produced in excellent vintages. It is fermented in French oak, sits on the lees for 12 months, and then ages in the bottle for another 3 years. I very much enjoyed this wine, with its intriguing complexity, with some apple and tropical fruit flavors as well as plenty of minerality. It had a strong, floral aroma and a lengthy, pleasing finish. At a retail price of $60-$65, the mark-up on this wine is low and is highly recommended. 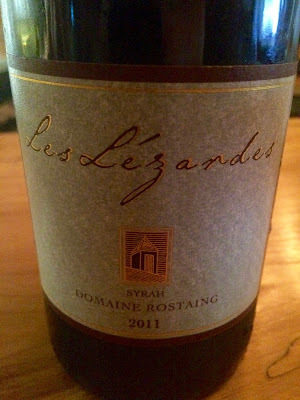 As for a red, we chose the 2011 Domaine Rene Rostaing Les Lezardes Syrah ($77), a Vin de Pays Collines Rhodaniennes. Rene has been a grower since 1971, eventually inheriting over ten acres of very old vines in and around Côte Rotie. This wine, one of his more value wines, is made from 100% Syrah, which was aged in old oak barrels. This is an elegant Syrah, with delicious flavors of plums, black fruits, deep spice notes and some herbal elements. The tannins are well integrated, there is good acidity, and a lingering, satisfying finish. Also highly recommended. During the dinner, we also enjoyed a glass of the 2014 Denis Lattard Roussanne, which is from the Drôme region, located on the western banks of the Rhone River in the northern Rhone. Denis Lattard, with a oenology degree, took over his father's chicken and vegetable farm in 1995 and realized the land once had grape vines. He decided to plant grapes, and now grows certified organic vines, producing about 15,000 bottles annually. 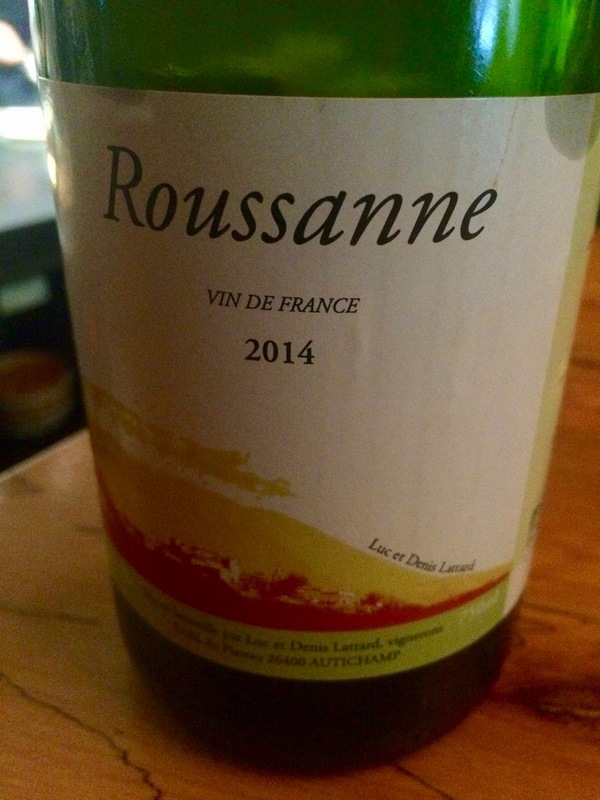 This Roussanne is made from 15 year old vines, fermented in old oak and then aged for a time in more oak. This was another compelling white wine, with lush tropical fruit flavors, some citrus, and a touch of mint. Easy drinking and lush, this was a delicious wine that went well with our food. At the tables in the main dining area, there are supposed to be drawers at each seat with all of your silverware. 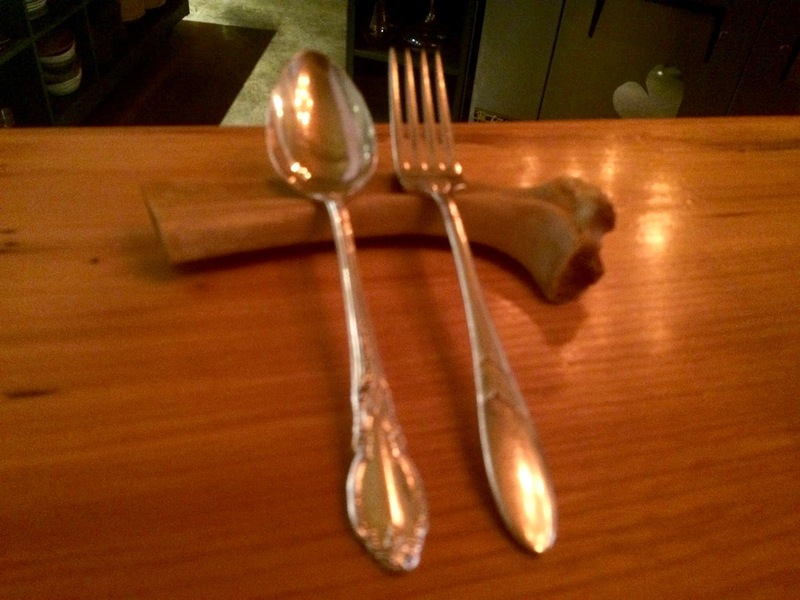 At the counters, the silverware is brought to you with each course, laying atop a bone. As I've said before, a great chef can get me to eat just about anything, even items I usually dislike. They have a way of transforming ingredients into delectable combinations which will appeal to almost anyone. Chef Crabb certainly qualifies as I enjoyed a couple dishes during the eventing that generally I would have avoided elsewhere. It started with an Amuse Bouche, a Radish Sandwich, and though usually I'm not a radish fan this was a tasty opener. Thinly sliced radishes, with interesting seasonings, on very soft bread (without any crust). Our first course was an Oyster Cracker, lying atop a piece of pottery. It was a crisp, over-sized cracker and contained an intriguing, creamy center, with a mild briny taste. So much tasty flavor hidden within this cracker shell. 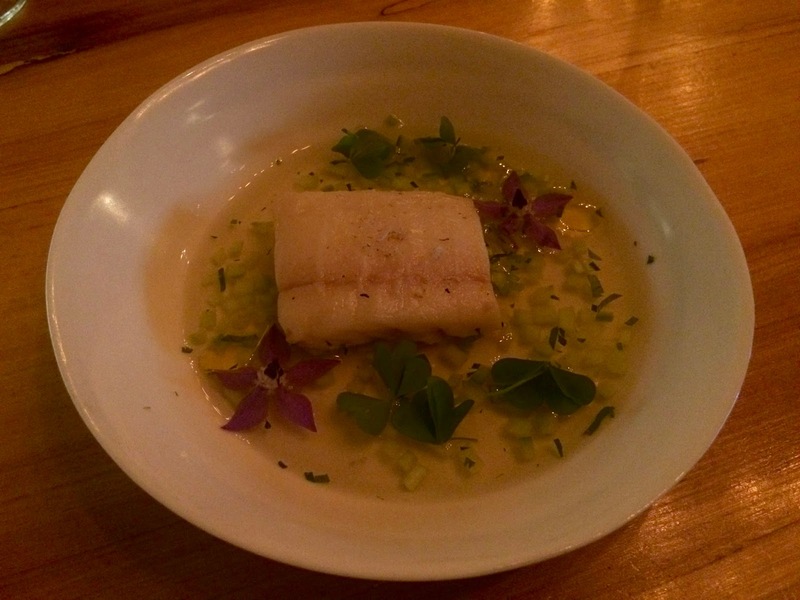 They gave us an extra course, which was on the five-course menu, Fluke with a cucumber dashi. I was expecting a warm dish but this was a cold dish instead, though quite delicious, The firm, flaky fluke was enhanced by the cucumber notes and the umami of the broth. We were served an ochoko of Sake with this dish. I was pleasantly surprised that Asta has two Sakes in stock, a Junmai and a Nigori, which they pair with various dishes though it isn't listed on their menu. We were served the Kaguyahime Junmai, which is produced by the Yamamoto Honke which was founded in 1677 in Kyoto. It was made with Biwaminori rice, milled to 60%, and made from soft spring water called Shiragikui, which translates as "water of white chrysanthemum." This Sake is smooth and light, with subtle flavors of melon, pear and mild honey notes. It goes great with seafood and has a nice umami taste that pairs well with umami dishes, such as those including dashi. The tender Squid, with parsley and fennel, had fresh and clean flavors. I was a bit hesitant about this dish, Poached Baby Onions with fermented rhubarb, as I'm picky about the onion dishes I like. However, there was no reason for trepidation as it was tasty, with a sweet onion flavor and the creamy cheese beneath the onions. The rhubarb added a little umami and herbal accents to the dish too. Mid-meal, we were delivered some fresh, house-made bread with a soft butter sitting atop a rock. the bread has a nice crusty exterior with a soft and chewy interior, enhanced by the flavorful butter. I enjoyed several pieces of bread. The Fava Beans with duck confit of course bring to mind Hannibal Lector's infamous line, except there wasn't any liver here. This dish was a nice blend of textures and flavors, and the small duck pieces were quite crisp and savory. Another surprising dish was the Dandelion with ricotta & raspberry, which didn't sound enticing with its brief description but in the execution it was amazing. Creamy and herbal, with mild fruity elements, I nearly inhaled this dish. The photo doesn't do it justice, and it shows what Chef Crabb can create from such a disparate group of ingredients. Another savory dish, the large Duck Egg, hidden beneath the sprouts and greens, had a soft, gooey yolk. Who wouldn't enjoy such a delicious egg with that strong yolk? With also got to taste another course, from the three-course menu, a Chicken Taco (and I don't have a photo). Two fresh corn tortillas held the chicken, sauce and slaw, and it was absolutely delectable, with such rich flavors, everything working harmoniously together. If these were sold out of a food truck, there would be a long line to buy them. I don't know much of the details of what goes into the sauce atop the chicken, but it was savory, with a little spice, and a touch of sweetness. We also enjoyed a couple palate cleansers, the first being a Sassafras Float with Fennel Sorbet. Wow, the bubbly drink had hints of root beer but was more dry than sweet, with clean flavors that were amplified by the compelling fennel sorbet. The Cucumber with frozen yogurt was a little bit creamier than the Sassafras though clean and refreshing too. Our first Dessert was Santa Rosa Plum, thin slices of tender, ripe plum atop a soft, moist cake. A light and fruity dessert which will satisfy your sweet tooth. I also got to taste the Smashed Peas with cornbread, which you might not even think of as a Dessert. Somehow it worked, with a sweet pea taste complemented by the moist cornbread. Finally, as a little extra, we received a plate of caramel corn, a peanut butter square, and a candy rabbit. The caramel corn was addictive and a sweet way to cap off a delicious and intriguing dinner. Overall, I was very impressed with Asta, including the service, its casual atmosphere, the cuisine and wine. Chef Crabb is creating inventive and delicious dishes while Shish has designed an intriguing wine list. I highly recommend you dine here and let yourself be open to the tasting menus, finding the adventurous diner within yourself. I'll certainly be back, seeking to try even more of the tasting menus. 1) Legal Sea Foods in Charles Square is continuing their “Endless Summer” series through August, with monthly themed eats exclusive to its al fresco Terrace Bar situated in front of the Charles Hotel in Cambridge. --Rhode Island Little Rhody Brand "Hot Weiner" complete with diced onions, meat sauce, yellow mustard and a steamed bun. 2) Located in Somerville’s Union Square, Brass Union is revamping the menu to highlight New England’s freshest summer tastes. Designed by executive chef Jonathan Kopacz, the updated carte du jour at this eatery and lounge will feature seasonal delights with ingredients sourced from the region’s local farmers markets and waters. Designed to be enjoyed indoors or outside on Brass Union’s dual-sided patio, the new additions include Stuffed Clams with chorizo, sweet corn and smoked tomato aioli ($10); a cornmeal-crusted Fried Catfish Sandwich with tartar sauce, arugula and tomato ($14); Sausage & Artichoke Pasta with spicy pork sausage, confit artichokes, fettuccini, asparagus, basil and roasted tomato (half: $12; full: $18); Market Fish served with squash, zucchini and spinach ($17); and, Roast Chicken Breast with pea purée, carrots and spring onion ($18). Sides include the market fresh Summer Vegetables ($6) and Grilled Corn with smoked tomato aioli ($6). Additionally, guests can savor summer with Chef Kopacz’s twists on a ballpark frank, the Choripán, an Argentinian-style chorizo “hotdog” topped with chimichurri and served on a Portuguese pop bun ($6), and the Kobe Beef Hotdog with pickled red cabbage and mustard ($8). On the liquid side, the beverage team at Brass Union is debuting new classic cocktails with refreshing flavors including apricot, rosemary, hibiscus and citrus. Under the direction of beverage director Paulo Pereira, these unique options are crafted with housemade sodas and syrups, peak seasonal ingredients and special touches. For the “Beginner” drinker, there is the Piping Plover with Privateer Silver, Campari, Cherry Heering, lemon and simple syrup ($12) and stepping it up a notch, the “Intermediate” cocktail option is the Sorrelbach with hibiscus-infused bourbon, Combier Triple Sec, simple syrup, Regan’s Orange Bitters, Peychaud’s Bitters and sparkling wine ($10). For the “Expert” enthusiast, try the Wicklow Buck with Glendalough Double Barrel Irish Whiskey, rosemary & apricot shrub, lime and ginger beer ($12). Pereira also is bringing back his red Portuguese-style Sangria, a secret recipe from the family vault ($8 glass; $17: half carafe, $32: full carafe). "With Champagne Gosset, the wine comes first, the bubbles come later." Although Champagne is very popular, there are still a number of misconceptions that exist about this sparkling wine. For example, I've said repeatedly that more people need to drink Champagne with food, to pair it with their dinner rather than just enjoy it as a celebratory aperitif. At a recent Champagne lunch at L'Espalier, a couple other misconceptions about Champagne were discussed. Representatives of Champagne Gosset led us through a tasting of a number of their sparkling wines, trying to illustrate and clarify a couple important points, concerning the reputation of non-vintage champagne as well as disgorgement dates. Champagne Gosset, which was launched in the U.S. by Wilson Daniels and is distributed in Massachusetts by Ruby Wines, presented "A Sparkling Retrospective," through Bertrand Verduzier, Export Director, and Hermine De Clermont Tonnerre, Assistant Wine Maker. Both Bertrand and Hermine were personable and knowledgeable, and it was fascinating to taste their Champagnes, especially the comparison tastings intended to illustrate the wonders of non-vintage Champagnes. The top export market for Gosset is the U.S., with their three main markets being Boston, New York City and San Francisco. Bertrand (pictured above) began the discussion, stating that an important goal of the tasting was to explore their Non-Vintage Grande Réserve Brut, which is the "face" of their winery. He wants to elevate the reputation of NV Champagne, to note its complexities and show how it develops with age. He also wanted us to understand the nature of the cuvee, and how the different components affect the final blend. The history of Champagne Gosset extends back over 400 years, to 1584 in Aÿ, a commune in the Marne region in Champagne. Pierre Gosset founded the winery, with the original purpose of producing still red wines as sparkling wine didn't come to the Champagne region until the 17th century. As such, Gosset lays claim to being the oldest wine house in Champagne. In 1993, the winery was purchased by the Renaud-Cointreau family. Jean-Pierre Mareigner has been the cellar master at Gosset for about 33 years, with a philosophy of: "At Gosset, we don't make bubbles, we make wines from Champagne with a real identity." This is a very personal approach to wine making and their current annual production is about one million bottles. They have the ability with their own vineyards and the growers they contract to concentrate on certain terroirs, to present Champagnes that are fresh and complex. Hermine continued the discussion, noting that they use about 200-300 growers, which contributes to a vast diversity of Premier Cru and Grand Cru regions, all providing a unique terroir. They have about 100 different fermentation tanks, allowing them to create a variety of wines from different grapes and terroir. In general, they do not conduct malolactic fermentation as they prefer to maintain high acidity and the taste of the terroir. They blind-taste to help determine their blends and they generally age their Champagnes for at least twice the minimum times referenced in the official regulations. We began with a glass of the current release of the NV Grande Réserve Brut, which was a blend of 43% chardonnay, 42% Pinot Noir, and 15% Pinot Meunier. The specific grape proportions vary a little from year to year, though no proportion is ever more than 50%. This particular wine had been aged on the lees for about four years, had a dosage of 8g/L, and was disgorged in 2015. Elegant, fresh and crisp, with pleasing flavors of citrus, apple and a hint of brioche. A strong backbone of minerality, plenty of complex and a lengthy finish. Delicious, this would stand on its own though should pair well with a variety of foods as well. We then got to sample the three individual varietals that make up the usual cuvee, all from 2007. The Chardonnay is supposed to bring "sharpness and vivacity" to the blend, the Pinot Noir is supposed to bring "roundness, fruitiness, and bond to the blend", and the Pinot Meunier is supposed to bring "structure and backplate to the blend." It was fascinating to see the individual components of the ultimate blend, to try to trace the elements which would end up in the cuvee. It also helped to indicate some of the difficulty for Champagne blenders, who must use these different ingredients to create a consistent product. As I've said before, the art of blending is an under appreciated aspect of Champagne production. Next up were three "older" NV Grande Réserve Brut Champagnes, which were educational in various ways. First, we noted how dosage levels have been decreasing over time, partially to better showcase the wine and not just the bubbles. Consumer tastes have also contributed in part to the use of a lower dosage. Dosage is more than just perceived sweetness but it also effects the balance of the wine, and as a wine ages, the dosages also lessens. Second, these older Bruts all have older disgorgement dates and Gosset generally doesn't want to place those dates on the wine label though they also won't hide the dates from anyone who really wants to know. The problem they see is that many consumers often mistakenly believe that a newer disgorgement is better, a "fresher is better" mentality. The importers of Gosset possess the disgorgement date, and they can disseminate to those who wish to know, but Gosset doesn't see sufficient value in placing it directly on the bottle label. The first Grande Réserve Brut was a blend of the 1999, 2000 and 2002 harvests, which was disgorged in 2007 with a dosage of 10g/L. The second was a blend of the 1982, 1983 and 1985 harvests, which was disgorged in 1990 with a dosage of 12g/L. And the third was a blend of the 1979, 1980 and 1982 harvests, which was disgorged in 1987 with a dosage of 11g/L. We could see the transformation of the NV Champagne over time, how this NV sparkling wine had as much complexity and age-worthiness as a vintage Champagne. Each of the three wines had its own unique flavor profile, yet there were also commonalities too, including a certain elegance and balance. And it was clear that older disgorgement dates don't negatively effect the wine. Another NV Champagne of note was the Cuvee 15 Brut (about $150), which is just coming onto the U.S. market. The best vintages from the late 1990s were blended, with 60% Chardonnay and 40% Pinot Noir, and the wine was cellared in 1999, to spend 15 years on the lees prior to disgorgment. With a dosage of 7g/L, only a small amount of this Champagne was produced. It presented with a more unusual aroma, almost cheese and earthy, though that didn't come out on the palate, which was bone dry, with plenty of mineral notes and a touch of brioche, citrus and green apple. There were layers and layers of subtle flavors, an intriguing complexity which was hard to put into words. A fascinating and delicious Champagne which is highly recommended. Gosset has also been experimenting with longer aging on the lees, but it is too early to know whether anything will develop from those experiments. Grab a dozen oysters and enjoy the Cuvee 15 Brut! As was said, "Wine is food and Champagne is wine," indicative of the intimate connection of Champagne and food. This was the introduction before our Champagne paired lunch. We began with an Amuse Bouche of Spearpoint Oyster, pickled vegetables, and citrus foam, paired with the Grande Rosé Brut. This Rosé is a blend of 58% Chardonnay and 42% Pinot Noir, with 8% red wine, and a dosage of 9g/L. Crisp, fresh, and tasty, with bright red fruit flavors, this was a compelling Champagne and worked well with the oyster and pickled veggies. I loved this Rosé and highly recommend it. The First Course presented NY Foie Gras Royale with toasted brioche, walnut & raw honey, rhubarb and yuzu. Decadently delicious, this dish was paired with the Grande Blanc de Blancs Brut, made from 100% Chardonnay with a dosage of 9g/L. With high acidity, lots of minerality and pleasing apple and pear flavors, this Champagne was able to stand up to the creaminess of the foie, the sweetness of the honey and the bitterness of the rhubarb. The Champagne was elegant and complex, with fresh, clean flavors. Another winner. The Second Course presented a dish of Wild Columbia River Salmon with Maine lobster, black poplar mushrooms, Maine crab and ramps. We drank the 2006 Grande Millesime Brut, a blend of 45% Chardonnay and 55% Pinot Noir with a dosage of 6g/L. Crisp and elegant, the dry palate was a complex melange of flavors, from green apple to brioche hints, plenty of minerality and a touch of lemon. It held up well to the rich tastes of the seafood, especially the lobster, and I could easily see a glass of this doing well with a New England Lobster Roll. For Dessert, we enjoyed a Raspberry Arugula Creme Puff with raspberry ice cream, paired with the 2007 Celebris Rosé Extra Brut. This Champagne is a blend of 59% Grand Cru Chardonnay and 41% Grand Cru Pinot Noir, with 7% red wine, and a dosage of 5g/L. Bone dry, this wine presents only the merest hint of red fruits, with citrus notes, some minerality, herbal elements and a lengthy finish. A more unique flavor profile for a Rosé, it was delicious and intriguing, complex and thought provoking. An excellent way to end our lunch. What are your thoughts on Non-Vintage Champagne? "Many Champagnes are good with food, but only one was made for food." Last month, I attended a Besserat de Bellefon lunch at L'Espalier and I was impressed with their Champagnes and how well they paired with food. Check out my prior article, Besserat de Bellefon: Champagne Made For Food, for more information on the winery as well as tasting notes for their Champagnes. This month, I was invited as a media guest to attend a Besserat de Bellefon dinner at Les Zygomates, a wine bar and bistro in the Leather District of Boston. I was excited for another opportunity to examine how well the Besserat Champagnes paired with food. Les Zygomates, which opened in 1994, is open for lunch and dinner, and also has a bar area where you can just get a cocktail or glass of wine. The menu, led by Executive Chef Gio Ceballos, includes plenty of French bistro fare, a Raw Bar, Charcuterie, and more. They are well known for their interesting wine list and their Beverage Director, Ashley Kompass, organized the Champagne dinner. The restaurant has a casual, neighborhood feel though the private dining rooms add some elegance to the experience. The intimate dinner, which was attended by about twenty people, was led by Matthieu Luneau, the Export Manager for Besserat. Matthieu is down-to-earth and personable, passionate about Champagne and food, and makes an excellent ambassador for this House. I'd already heard many of the details about their Champagne that Matthieu mentioned at the dinner, but I also had the opportunity to ask him some additional questions. I won't repeat what I previously wrote in my prior article on Besserat, but will expand on a few points. As I previously mentioned, in 1930, a famous Parisian restaurant, the Samaritaine de Luxe created a contest to see which Champagne house could produce the best sparkling wine to pair with food. To give some more context, in 1930, there were many artists in Paris and they often threw parties, drinking heavily, including lots of Champagne. However, they weren't drinking it with food so it was a revolutionary idea to drink Champagne with dinner. Four Champagne producers participated in the contest, with Besserat using a lower tirage in their Champagne than the other producers, basically only 19 grams as opposed to the usual 24. And that was the key to Besserat's victory. I asked Matthieu, who has spoken to many groups and journalists over the years, about what question does he wish someone had asked him but never did. To him, the most compelling concern was whether people truly understood how Champagne was produced. How much do they know about the actual process? Do they understand why Champagne is expensive? What is the difference between a $10 Prosecco and a $50 Champagne? It is important to Matthieu to educate the average consumer about these matters, so they can make better informed choices. At the wine shop I work, I have seen many customers who don't fully understand about Champagne. A significant number of them refer to all sparkling wine as Champagne and the higher price can turn them away. However, many of these same customers also want sparkling wine to celebrate, or make mimosas for brunch. They rarely come in seeking sparkling wine to pair with dinner. Education for these consumers is thus important. For Matthieu, the Besserat Champagnes can pair well with most any dish, even some which are considered difficult pairings, such as asparagus. He did note though that some heavy sauces can be a problem and could overwhelm the Champagne. As such, meat dishes and others without heavy sauces will work better with their Champagne. At my prior lunch, the various dishes were enhanced by the Champagne and my dinner at Les Zygomates was no different. Each of our four courses worked very well with the different Champagnes, and I gained an even deeper appreciation for Besserat de Bellefon. We began the evening with the NV Besserat de Bellefon Cuvée des Moines Brut ($45), which I previously stated is "a blend of 35% Chardonnay, 20% Pinot Noir, and 45% Pinot Meunier. This is their flagship wine, which accounts for about 55% of their total sales. It is not a traditional Brut but rather a Prestige Cuvée, with a dosage of about 4.8 grams. You should note that this wine, as well as the Extra Brut, has a high percentage of Pinot Meunier, which is uncommon for many Champagne Houses. This wine also was creamy and elegant, dry with good acidity, and with tasty flavors of lemon, pear and salted nuts." With this wine, we enjoyed a Mango Crab Tower, with Avocado, that contained plenty of sweet crab meat enhanced by the fruit flavors and acidity of the mango. The Brut is an excellent choice for pairing with seafood and the crab tower was thus a fine pairing with this bubbly. Crisp, fresh and dry, the Brut would do well with other crab dishes, as well as everything from oysters to sushi. It would be a good introductory Champagne to show people how it can pair well with food, and the benefits of doing so. For the second course, they poured the NV Besserat de Bellefon Cuvée des Moines Blanc de Blancs ($75), which I previously wrote "is made from 100% Grand Cru Chardonnay from Cotes des Blancs. This style was added to their portfolio in 1999. Creamy, dry and crisp, this Champagne presented an appealing and complex blend of flavors, including light toasty notes, bright citrus and honey elements. Plenty of chalky minerality and some floral accents, with a lengthy and pleasing finish." This course included an intriguing and delicious dish of Fried Oysters, Smoked Bacon and Bleu Cheese Dressing. Though Matthieu noted some initial trepidation with the Champagne's pairing with the smoky bacon, as soon as he tasted the dish with the bubbly he was a convert. The Blanc de Blancs went great with the fried oyster, and would do well with many different fried foods, but it also did well with the salt & smoke of the bacon, as well as the more pungent flavors of the blue cheese. A number of attendees noted that this was their favorite Champagne of the tasting and it certainly was excellent and versatile with food. Next up was the Vintage 2006 Besserat de Bellefon Cuvée des Moines Brut ($80), which I previously wrote was "a blend of 54% Chardonnay, 15% Pinot Noir, & 31% Pinot Meunier. This is their current release and they don't always produce a vintage Champagne each year. This Champagne possessed a bright gold color and reminded me of the Brut except at a higher level, with more intensity and complexity. It was still elegant, yet with more restrained power. Crisp and dry, creamy and delicious. A beautiful and harmonious melange of flavors, including apple, pear, almonds, spice and brioche. There is so much going on in the glass." The last vintage before this one was 2002, which was a great year, and the next vintage will be 2008, which also was an excellent year. This Champagne can stand up well to meat, such as the Roasted Duck Breast with Fig Jam, tender and flavorful duck enhanced by the sweetness of the fig jam. I love duck and this was a delightful dish, and the complexity of the Champagne wasn't overwhelmed by the dish. I think this Champagne would work well with lamb and wild boar too. It possesses plenty of power yet it is still restrained as well, and thus can handle a stronger dish. The final Champagne of the evening was the NV Besserat de Bellefon Cuvée des Moines Brut Rosé ($70) which was one of my favorites of their Champagnes. I previously wrote that it is "a blend of 30% Chardonnay, 30% Pinot Noir, & 40% Pinot Meunier. They started producing a Rosé in 1972 and it has become very popular in the U.S. With a rich salmon color, this is a compelling Champagne, with bright red fruit flavors, a mild smokiness, peach & orange zest notes. It is crisp and clean, elegant and dry. This is a Champagne I could easily drink all night. It was paired with a couple cheeses and was a very pleasing companion. I think this would be a versatile Champagne for food pairings and I'd happily drink it with pizza or a burger." I had the Rosé once again with a Duo of Artisanal Cheese, which was an easy and enjoyable pairing. Even with the different flavors on the cheese plate, from the fruit to the honey, the Rosé did well. It is such a delicious and easy drinking Champagne, yet still is complex, and it remains one of my favorites. Once again, I highly recommend you check out the Champagnes of Besserat de Bellefon and pair them with a variety of foods. And make sure to dine at Les Zygomates, and enjoy their seafood and bistro fare, accompanied by some fine wines. I'm sure Ashley can offer some excellent pairing advice for you. When I speak with family and friends, as well as people I've just met, they often ask me for restaurant recommendations. Sometimes they have specific questions, such as they are seeking a reasonably priced Italian restaurant in the North End, while other times they simply want to know some of my current favorites. Though I usually provide them the link to my blog for additional consideration, I also provide them a few of my top restaurant recommendations, those hot spots which are most on my mind at the moment. There are plenty of local restaurants which deserve kudos, such as those places on my Top 50 list. However, I want to provide a list of my 5 Restaurant Hottest Restaurants, those which I am most recommending to people right now. These are places with quality food at reasonable prices, and those I refer to these restaurants usually provide me very positive feedback of their experiences. These favorites of mine become their favorites as well. Ciao! Pizza & Pasta: Including this restaurant on this list was a no-brainer. Located in Chelsea, this hole-in-the-wall restaurant serves some of the best pasta and wood-fired pizzas in the Boston area. Above is one of my favorite dishes, House-made Campanelle with Chorizo Bolognese, and it is difficult for me not to order this dish every time I dine there. It's prices are very reasonable and cheaper than many "artisan" pizza joints. The menu sees some changes every few weeks and they also serve wine & beer. The food quality is consistently excellent and the restaurant offers a casual and friendly atmosphere. I frequently dine here and everyone I bring here raves about it afterwards. I cannot recommend this spot highly enough. A&B Burgers: If you love burgers, then you need to trek to Beverly to dine here, to savor some of the top burgers in the area. Using a special oven, they are able to slow cook their burgers, made from local, sustainable beef, for almost two hours before searing them on the grill. That ensures the burger is juicy and flavorful. The burgers are also reasonably priced and fully customizable. Above is my favorite of their burgers, the Sweet & Salty Burger, topped with Burrata cheese, fig jam, bacon, & arugula. The restaurant is more than just burgers though, with delicious dishes from Smoked Gouda Mac n' Cheese to Louisiana Fried Wings. And don't forget the Churros for dessert. In addition, they have an excellent drinks program, from their 100+ tequilas to their adult milkshakes. Committee: Greek cuisine is hot right now and Committee, located in the Seaport district, is one of the top local spots to experience this delicious and fascinating cuisine. With traditional Greek recipes as well as some more modern twists on Greek dishes, the food here is compelling and delicious, from Brunch to Dinner. Above is Tyropita, an amazing breakfast pie made from phyllo, feta, kasseri, vlahotiri, and rigani. Everything from the homemade Hummus to the Lahmajun (kind of a spicy, ground lamb pizza) is consistently excellent. Their drinks program is also excellent, with numerous Greek wines and spirits as well as inventive cocktails. The Porch Southern Fare: Located at a small spot in Wakefield, this restaurant, which has been open for less than six months, offers delicious southern fare which is made form scratch. The menu is small but it allows them to concentrate on the quality of those items, from North Carolina Pulled Pork to Meatloaf (and though I generally am not a fan of meatloaf, I love the meatloaf here). Above is their moist Fried Chicken with mashed potatoes and corn bread. And their home-made biscuits with honey butter are killer! The quality of the food, especially some of the sides, has even improved since my initial review. They offer some excellent specials as well, such as Chicken Fried Steak, and they have some very reasonably priced family dinners for take-out. They now offer Brunch though I haven't yet been yet though hope to check it out soon. Tasty On The Hill Cafe: In Somerville, you'll find this Portuguese owned cafe which offers a unique and delicious dish which is difficult, if not impossible, to find anywhere else in the Boston area. Above is the Francesinha, a famous sandwich from Oporto, and the cafe offer six variations, including the Traditional which is made with American cheese, ham, steak, linguica, hot dog, fried egg and bacon. What a hearty sandwich and the tomato-based sauce atop it is savory and compelling. It has to be one of the top sandwiches in the area. In addition, the cafe serves a full menu of more standard breakfast and lunch items, with additional Portuguese dishes for dinner. Their house-made muffins are excellent too. Which of these five restaurants have you visited? And what are your thoughts?